A new research project, “Extended Life Concrete Bridge Decks Utilizing Internal Curing to Reduce Cracking,” prepared for the Ohio Department of Transportation addresses the ongoing concern about premature cracking of concrete bridge decks by looking into the benefits of using lightweight fine aggregate (LWFA) in concrete mixtures to provide internal curing. 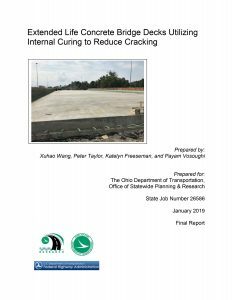 The report includes a suggested specification for internally curing concrete with LFWA to increase the probability of achieving crack-free, long-lasting bridge decks. The report was prepared by National Concrete Pavement Technology (CP Tech) Center and InTrans researchers Xuhao Wang, Peter Taylor, Katelyn Freeseman, and Payam Vosoughi, and is available here. View additional details about the research project here.